Lawsuits are so common these days that no one pays attention to them anymore. But, did you have an idea about the extent of pending lawsuits in the mobile industry? We hear about one company suing another for patent infringement all the time, but I doubt that we actually spend much time on thinking about these things. 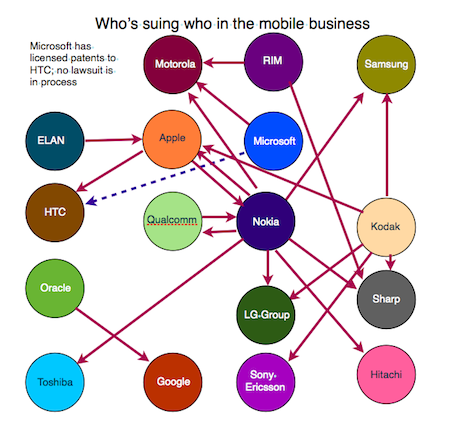 Just recently, tech blogs and new sites exploded with reports on how Microsoft is suing Motorola over the latter’s line of Android phones. The lawsuit involves several cases of Motorola supposedly violating certain patents belonging to Microsoft. This is not the sole case, though. There are lots of others that have been on in this sector. Here’s an interesting – amusing, actually – visual representation of what’s going on in that world, courtesy of The Guardian. I don’t know about you, but one look at that, and I was exclaiming “What heck is wrong with these people?” I guess if it’s millions of money involved, then people take on a different perspective. In any case, the average consumer – you and I – will not have to worry about these lawsuits as they do tend to get settled. We just keep on going with our every day lives and buying whatever catches our fancy.